USA 5 Panama 0. Goals: Mewis 5, Lloyd 23, 29, 48, Press 32. Once again, the USA was barely challenged, winning its second game at the Concacaf Women's Championship with a 5-0 win over a young and inexperienced Panama playing in the final round of qualifying for the first time in more than a decade. Sunday's other result -- Mexico's 4-1 win over Trinidad & Tobago -- assured that the USA will advance to next Sunday's semifinals that will decide the first two Concacaf qualifiers for the 2019 Women's World Cup in France. 1. U.S. bench is scary deep. Coach Jill Ellis emptied her bench, starting everyone who began Thursday's opener against Mexico on the bench, plus defender Abby Dahlkemper and midfielder Julie Ertz. 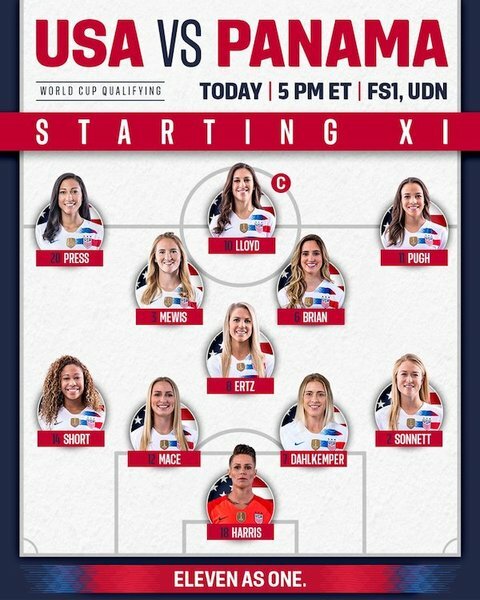 While the back four is relatively inexperienced -- they entered the game with a combined 77 international appearances, two in competitive matches -- five of the other six field players have played in the Women's World Cup or Olympics or both. Carli Lloyd and Christine Press, two of five 2015 world champions in the starting lineup, combined for four goals and two assists. 2. Carli Lloyd still has a big role on the team. Lloyd came into the tournament with 102 international goals, but her role on the team was something of a question mark. She started only three of 13 games this year and hadn't start in almost six months. But Lloyd, 36, showed she has not lost her scoring touch, finishing with a hat trick against Panama -- the eighth international hat trick of her career. The finishing of others left a lot to be desired on Sunday, but Lloyd was efficient. She put away headers off a Christen Press corner kick and Rose Lavelle free kick and scored a nifty goal when she eluded three defenders to get open in the middle of the Panama area and calmly score from 12 yards out. 3. Valiant Panama is very much alive. Most of the nations in Concacaf remain far behind the USA, Canada and Mexico, which have accounted for 16 of the confederation's 17 appearances in the Women's World Cup. All the traditional Central American men's powers with the possible exception of Costa Rica have neglected their women's programs. But Panama, one of just four UNCAF nations to enter 2019 World Cup qualifying, held the USA scoreless for the last 42 minutes after falling behind 5-0. Its 17-year-old goalkeeper, Yenith Bailey, made 12 saves, several of them spectacular, to keep the score respectable. The 5-0 result was better than Mexico managed against the USA -- 6-0 loss -- and puts Panama in a position to advance to the semifinals with a win or tie against Mexico in their group finale on Wednesday. TRIVIA. The USA's current unbeaten streak stands at 23 games (20-0-3) with a goal advantage of 76-17. USA -- Harris; Sonnett, Dahlkemper (Horan, 77), Mace, Short; Ertz (Lavelle, 46), Mewis, Brian; Pugh, Lloyd, Press. Panama -- Bailey; Jaen, Murillo, Pinzon, Alvarado (Rangel, 34); Castillo, Quintero, Batista, Riley (Cedeno, 59); Cox, Mills (Hernandez, 59). 5 comments about "USA-Panama Concacaf Women's Championship: Lloyd shows class in another easy U.S. win". James Madison, October 7, 2018 at 11:53 p.m.
1. Increasingly sloppy play by USA as the game wore on, as distinguished from the discipline that marks champions. 2. Will we ever get to the point that women are treated by the press, i.e., SA, as equals to the men by assigning player ratings to the women as they are assigned to the men? Michael Saunders, October 8, 2018 at 9:26 a.m. Echoing the point that has already been made: When will the media assign player ratings to the women as they are assigned to the men? frank schoon, October 8, 2018 at 9:45 a.m. This game was 5-0, the one before was 6-0...With scores like that I'm not really interested in seeing ratings. Any idiot can halfway look good in these types of games. The very fact that we're playing competition, weak opponents, does not nothing for the US team. Ratings are only meaningful when playing tough competition(if there is any). Bob Ashpole, October 8, 2018 at 11:03 a.m. I don't care for "player ratings" at any level for either gender. It is a team sport. frank schoon replied, October 8, 2018 at 11:12 a.m.